Front or rear disc brake pad or shoe replacement with Mopar®/Magneti Marelli® Brakes (semimetallic). Inspect rotor, drum and caliper(refacing/machining extra). Check brake fluid level. Road test vehicle. Some vehicles may be higher. Front or rear disc brake pad or shoe replacement with Mopar®/Magneti Marelli® Brakes(semimetallic). Refacing/machining rotors or drums. Inspect calipers. Check brake fluid level. Road test vehicle. Some vehicles may be higher. Engine oil replacement up to 5 qts. New Mopar®/Magneti Marelli® Oil Filter. Fluid level inspection. Additional charges may apply. Must present the original coupon upon arrival for initial service. Inspection of these and additional items not listed: tires/tire pressure. Windshield wipers. Exterior lamps. Cooling system mixture/leaks. Air filter. Fluid levels. Belts/hoses (excludes timing belt). Price does not include repairs, which may be required after inspection. System check which will assess: Electronic load levelers and air suspension (if applicable). Electronic transmission/transaxle. Electronic fuel injection. Air bag system. Charging system. Seat restraints. Engine control computer. Instrument cluster. A/C system performance check. Refrigerant and testing components for leaks are extra. 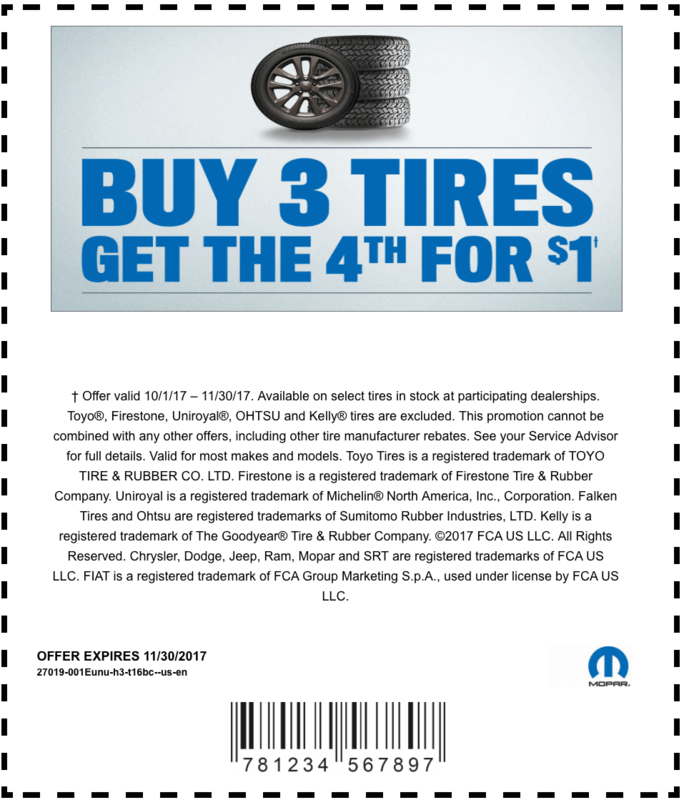 Must present the original coupon upon arrival for initial service. Battery test. Voltage regulator test. Alternator/generator test. Must present the original coupon upon arrival for initial service. 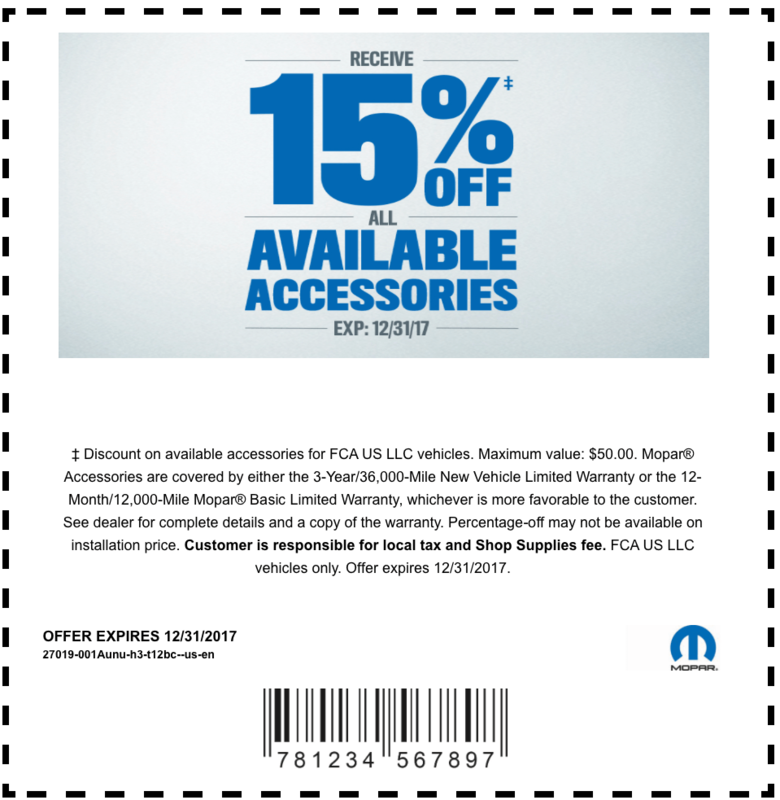 Discount on available accessories for FCA US LLC vehicles. See dealer for complete details and a copy of the warranty. Percentage-off may not be available on installation price. Discount on service and/or parts purchases. Total purchase must be $15 or more. 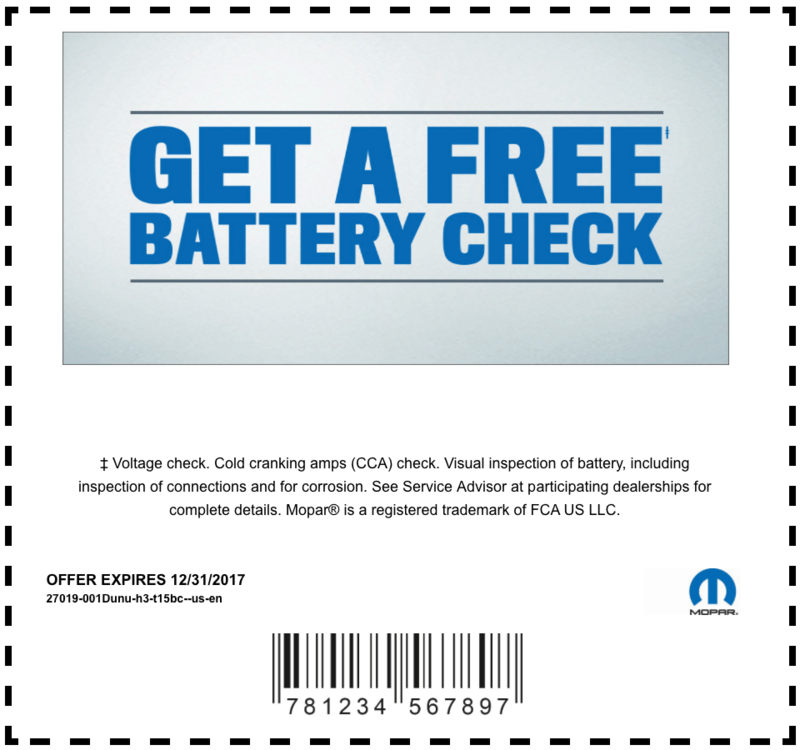 Redeemable at our dealership only. Not applicable to previous charges or existing accounts. Not redeemable for cash or body shop repairs. New Mopar®/Magneti Marelli® Cabin Air Filter. Installation of filter. Must present the original coupon upon arrival for initial service.